Semper Fi – Always Faithful! Recognize the slogan? I’m sure you do. It belongs to the Marines. Semper Fidelis. Though usually heard in the shortened form, Semper Fi. As they say, they are The Few. The Proud. All military branches are heroes to me. I love them all. The men and women that serve our country, risking their lives for ours, stand tall in my eyes. But the Marines. There is something a little different about them. They are on duty 24/7, every day of the year, on base or off base, in uniform or out if it and are to act with decorum, defined as dignified propriety in behavior, speech, and dress. Even their uniform, the dress blues, projects a special image. Their watchwords are loyalty, honor, courage, and commitment. Semper Fi, as one site says, voices “loyalty and commitment to their Marine comrades-in-arms.” Therefore, in combat, Marines never leave a wounded comrade behind. * a faithful worker, true to one’s word, promises, vows, etc. So, are we, as Christians, as faithful as the Marines? Do we thump out chests with our fists and say, “Semper Fi” to our Christian comrades-in-arms? * true to our word? Are we faithful to our heavenly country, being quality citizens? Are we faithful to each other? Are we faithful in our behavior, speech, and dress, 24/7? Do we keep the highest standards, ethically and morally? Are we committed to our Christian comrades-in-arms? Do we have an attitude of unbreakable commitment, in combat and in life, so that we do not leave our wounded brothers and sisters behind when they are in a battle? Are we courageous and disciplined warriors in our efforts to fight off the enemy? So, are you…the few? The proud? Always faithful? Semper fi! I’m honored to be a part of the One Word Blog Carnival. Please visit Bridget Chumbley’s site to read the wonderful blog entries for “faithfulness.” Also at Chatting at the Sky, Tuesdays Unwrapped. Your sentence, “Therefore, in combat, Marines never leave a wounded comrade behind” reminded me of those times when we have a choice to either walk away or help a lost or wounded soul as a Christian. Especially when life has been really tough for so many hurting individuals, I believe your post is a wonderful reflection of what God has put on this earth for- to help one another. I absolutely love the analogy…my dad was a Marine and also a faithful follower of God. This one definitely got me thinking today! Thanks, sweetie! I love that part also. Sometimes, we shoot our wounded, leaving them by the roadside. We don’t care. If we are Christ-like, we are to care, as the good Samaritan, to do what we can for a hurting brother or sister in Christ. Blessings to you! God bless the Marines, every single one of them. Love the parallels you make here, Miss Lynn. My older brother was a Marine — and it was likely one of the best experiences he could have had in his (then) young life. Never had I seen him so steadfast as when he was in the Marine Corps. Good post. Hey, Billy-boy! Thanks so much for your kind words! I appreciate it, coming from my hero! Be blessed! Glynn, Thank you so much for stopping by and commenting. I am honored. There really is something special about the Marines, isn’t there? I’m sure you are very proud of your brother. Blessings to you! Awesome, Lisa! I’m sure you are very proud of hubby. Tell him hubs and I said thank you! Thanks for reading and commenting! Makes my heart very happy. And now that you mentioned it, the song will be stuck in MY head all day! LOL! Blessings to you and hubby! 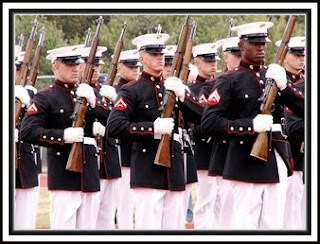 My dear Lynn, this essay reminded me of an article I wrote for my blog about our failure to represent Christ the way the Marines represent the Corps. If you want to read it, link to http://passionateforthegloryofgod.blogspot.com/2009/06/grand-opportunity.html. Thank you for reminding me of my heritage. Oh, Lynnda! That was a marvelous post. I wish I had been there. How wonderful! Thank you for sharing the link with me. I thoroughly enjoyed reading it. Blessings to you! Great post and analogy, Lynn. A wonderful example of faithfulness that gives us a high standard to follow in our own lives. Thank you. I loved this post. The marines truly are the few and the proud. I also love that you’re the only one who can get away with calling Billy Coffey “Billy-boy”. Snort! Thank you, Bridget! I truly treasure your comment. So honored you dropped by! Blessings to you! LOL! Kat, that’s what happens when you get to be old and a grandmother! You can get away with name-calling! LOL! I’m so happy you took time to visit! Thank you! Be blessed! Lovely post, Lynn! What a great comparison between Marines and Christians. We could certainly take a few pointers from them in living our lives. Nice piece, and I love JoAnne’s analogy. Thank you, sweet Connie! Always blesses my heart to see you! Bless you! Hey, Louise! So glad to have you visit. I love that saying! Thanks so much for sharing it. May the Lord bless you! Hey, Sheila! So good to see you! Hope all is well with you. Thank so much for stopping by. Blessings to you! That’s where our true citizenship is, isn’t it? Wow. I want to be a Marine for Jesus! When I weary, thoughts of one day hearing those words keep me faithful. Thank you for honoring those who protect our freedom with blood. The picture on this post gave me goose bumps – what faithful servants our men in uniform are. Beautiful analogy! God always rewards faithfulness which is borne out of obedience like Abraham did: this qualified him to be a friend of God. Keep on scribbling. Wonderful post and a great reminder to us all to live with such passion and committment. Relevant post. I served in the British Army for 43 Years until retirement last August. US and UK Forces have operated together in two world wars, in Iraq and now Afghanistan – the UK Royal Marines have a close affiliation with the US Marine Corps. Service is given voluntarily and becomes a whole life choice. The standards expected are different and higher than, may be expected in Civil Life. There is an enormous amount of faith and trust in comrades, belief that what you are doing is making a difference to peace and security. The Military is a place where faith is found, not explicitly, but at a deep profound level – and military chaplains are widely respected, accepted and do vital work in maintaining morale. In the UK forces they are unarmed, therefore, reliant on those around them to protect them. This is unique to them. My Corps motto was “Animo Et Fide” (Loyalty and Fidelity). Semper Fi! I try in every way. I learn every time I fall that He’ll pick me up, dust me off, and I can keep going with a lesson learned tucked in my heart. When unpleasant people cross my path, I try to remember the higher road and now Semper Fi!